Kimberly Streater poses with her son Howard Lewis,18, in her office at the Center for Wellbeing of Women and Mothers/ MOMS Partnership in New Haven. New Haven resident Kimberly Streater was pregnant with her third of six children when she called her friend for a ride to the hospital after sustaining a hit to her stomach by her then-husband. When she reached the hospital, Streater, not yet 28 weeks pregnant, alerted personnel that her baby was coming—now. “They said, ‘No, no, he’s not coming,’ after I told them he was,” she recalled. Minutes later, Howie was born at 3 pounds and 1.5 ounces in the admitting area of the hospital, just as Streater had predicted. Statistically, the preterm birth of Streater’s baby does not come as a surprise. In Connecticut and nationwide, black women and their infants suffer disproportionately worse pregnancy-related health outcomes than white women. The March of Dimes’ 2017 Premature Birth Report Card for Connecticut revealed that between 2013 and 2015, 8.4 percent of all (live birth) infants born to white women were premature, compared with 12.4 percent of infants born to black women. Statewide, after a complication-free delivery, black women are twice as likely as white women to be readmitted to a hospital within 30 days, according to a 2015 study published in the journal Obstetrics and Gynecology, which drew from statistics maintained by the Connecticut Department of Public Health. These racially disparate outcomes mirror persistent racial gaps nationwide. Babies born to black women are more than twice as likely to die in the first year of life than babies born to white women, and black women are 243 percent more likely than white women to die from pregnancy-related complications, according to the Centers for Disease Control and Prevention. These statistics aren’t new. What’s new is how some professionals throughout Connecticut—from psychiatric researchers to community activists to medical doctors and progressive health centers—are reframing the way racial disparities are addressed: by re-examining their root causes and coming up with new solutions. This close examination of racial disparities in pregnancy-related outcomes coincides with a recent push to address the nation’s discouraging overall maternal death rates, which increased by more than 25 percent between 2000 and 2014, while those in other developed countries declined, according to a study published in the journal Obstetrics and Gynecology. New Haven Healthy Start (NHHS), a community-based program, has been working for three decades to identify and eliminate racial disparities in birth outcomes. The organization has examined several factors as possible culprits in the racial divide, including poverty, health insurance, and access to prenatal care. Ultimately, they homed in on one factor. “Racism. Discriminatory practices based on race. That’s what we’ve been focusing on,” said Kenn Harris, president of the board of directors of the National Healthy Start Association and project director at NHHS. In response, they offer a program where women, regardless of their race, feel truly supported throughout their pregnancy. At the heart of NHHS’s simple yet highly effective strategy is its care coordination service model, recruited from places including libraries, laundromats and beauty salons within the communities they serve. They do outreach at strategically located places where pregnant women in the program’s target population are likely to visit, including community health centers and homeless agencies. Every participant is assigned a care coordinator, who provides an array of support—from helping them sign up for state Medicaid to arranging transportation and childcare to reaching out to them if they miss a doctor appointment. The key to these care coordinators and other employees at NHHS? They look like the women they serve, and, in many cases, they’ve been through similar situations. Natasha Ray, a 49-year-old resident of East Haven, had her first of four children at 16; all her infants were born premature. Now she’s the core service manager at NHHS. “My interest in the program was personal. Here was a program whose focus is on prematurity, health disparities and strengthening the fragmented system that families must navigate. I feel that this was an opportunity to be the person for so many mothers-to-be that I did not have. When you know better, chances are you will do better,” Ray said. The approach works. In 1987, one in every 50 infants born in New Haven died in the first year of life. Today, only one out of every 222 infants whose mothers are enrolled in NHHS dies in the first year of life, according to the Community Foundation for Greater New Haven, which runs the Healthy Start program in New Haven. In 2017, 1,402 women were enrolled in NHHS. Of these, 43 percent were black, 38.5 percent were mixed race, 16 percent white, and 2.5 percent Asian. Another program making a difference in the health of black moms is The New Haven MotherS (MOMS) Partnership. This community–academic partnership, founded in 2011 by Yale associate professor of psychiatry Megan Smith, DrPH, MPH, seeks to improve maternal mental health among low-income women through a community-driven approach. “We know that depression co-occurs with trauma and anxiety disorders, particularly post-traumatic stress disorders, and that they can increase a woman’s chance of preterm birth,” said Smith, who is also the program’s director. Smith said she started the MOMS partnership because of increasing racial inequities she observed related to mental health care among New Haven residents. “They’re more likely to drop out of mental health care programs, and less likely to receive high quality mental health care,” Smith said of the women targeted by the MOMS partnership. Since its inception, the program has reached more than 500 low-income moms and pregnant women from New Haven, about 70 percent of whom are women of color. The program provides outreach to mothers and pregnant women in targeted neighborhoods of New Haven, requesting that they complete mental health assessments. Those who demonstrate need receive cognitive behavioral therapy in familiar settings, including the second floor of the city’s Stop & Shop grocery store and other citywide locations. The treatment setting is non-threatening; so too are the community mental health ambassadors (CMHAs), employees who recruit participants and accompany them to treatment. CMHAs are mothers from the local community trained to focus on target population outreach and, when deemed necessary, to support mental health treatment. They work alongside traditional mental health clinicians. Most possess customer service experience; they all empathize with the participants’ struggles. Smith attributes the program’s overwhelming success largely to the ambassadors and the community settings where they serve women. To date, over 70 percent of participants registered for cognitive behavioral therapy through the partnership have adhered to treatment, and more than 50 percent report decreased depressive symptoms. Kimberly Streater with her youngest daughter Nevaeh Lewis,14, and son Howard Lewis, 18. 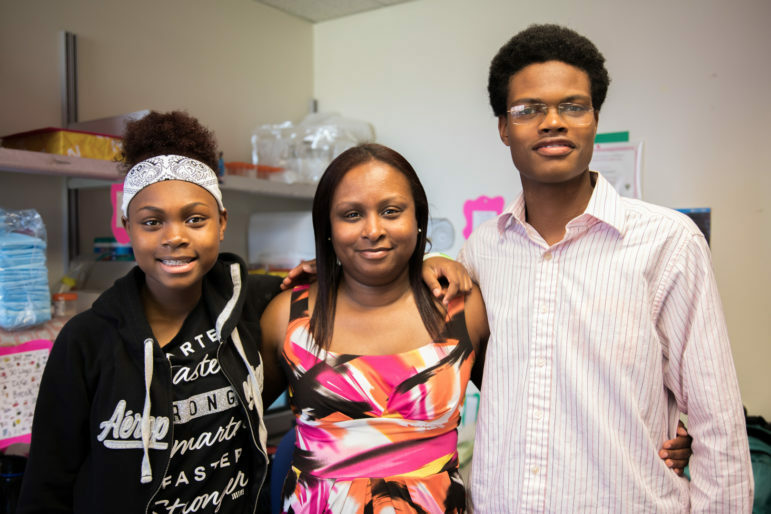 Streater, who gave birth prematurely to two of her six children, is a CMHA. She learned about the job when taking a free stress management class about five years ago. Streater says she didn’t have much of a support network as a pregnant or new mom. “It was pretty much me,” she said. Implementing simple, common-sense practices within existing healthcare systems also lends support that can help close racial gaps in pregnancy outcomes. At Southwest Community Health Center in Bridgeport, about 80 percent of the patients that advanced practice midwife Janet Spinner sees are women of color. She’s pleased about the decisions the center makes to accommodate its patient population’s health needs. For instance, instead of waiting to see patients at the typical six-week postnatal visit, Spinner has new mothers come for a checkup between one and two weeks after delivery, then again at the six-week mark. “That’s when scary post-pre-eclampsia can rear its ugly head,” Spinner said of the dangerous medical condition that occurs more frequently among black women and can happen during or shortly after pregnancy. Spinner also uses the initial postnatal visit to check in with patients about breastfeeding, social support, and intimate partner violence, which she refers to as “the elephant in the room.” And, Spinner says, the Bridgeport health center provides strong diversity training to its employees, a trend she sees becoming more prevalent throughout the state. “We really need to talk about this as a community,” she said. Black women might be more likely to go to the doctor’s office when the doctor looks like them. Marcia Tejeda, MD, a black OB/GYN who works in Waterbury, acknowledges that she probably sees 5 to 7 percent more black patients than the other physicians in her group practice—a choice based on her patients’ preferences. Although Tejeda says she feels all the physicians with whom she works make a “tremendous effort to give all women excellent care,” she does suggest that, in general, doctors and other medical professionals could benefit from education and training that focuses on how to improve their interactions with black patients, including learning how to better understand their culture and improve ways of communicating with them. Tejeda also proposes that race-specific research initiatives occur more routinely.